Trimming the sail, skeg and fore fin when paddle sailing. Both Karitek and P&H are now supplying sea kayaks with a forward fin to increase upwind performance when paddle sailing. potentially this may confuse some paddlers so I spent the early part of last summer experimenting to find the best way to use the new fore fin with the conventional rear skeg. It is important to note that the fore fin offers greatest performance benefits to shorter kayaks like the P&H Aries. The effect is much less pronounced in longer sea kayaks like the Cetus MV/HV which can paddle sail at about 45 degrees to the wind even without a forward fin. Secondly even in a short sea kayak like an Aries you can still have a great deal of fun and paddle sail at about 60 degrees to the wind without a forward fin. A final point to note is that you won't have much fun if you just sit there like a stookie and let the sail do the work. This is paddle sailing and just like motor sailing a yacht, your paddling will increase the apparent wind from the bow and this increases the efficiency of the sail. When beating into the wind the rear skeg should be fully up, and the forward skeg (if you have one) should be fully down. The sail should be sheeted in but not too tightly. You aim to sail as close to the wind as possible without the wind getting round the back of the leading edge (luff) of the sail and collapsing it. You can adjust the angle the kayak is sailing to the wind by altering the power on each side of your paddle stroke or by momentary edging. It is however important to keep the hull of the kayak flat on the water most of the time as the kayak will slow anytime it is edged (an edged kayak hull is less streamlined and offers more resistance to water flow). 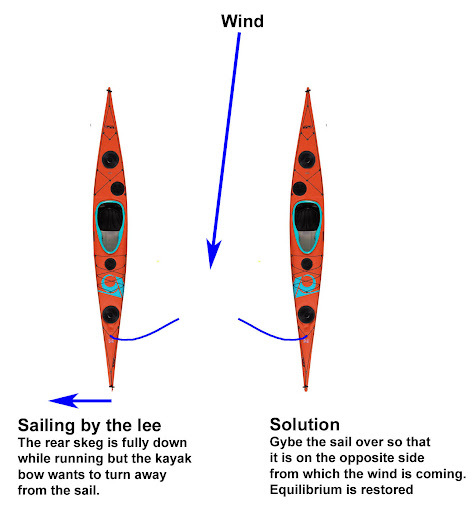 Also if you try to maintain your course by constant edging the sail will not be perpendicular to the wind and wind will spill from the top or bottom depending on which way you are edging, away from or towards the wind).Beating in winds of force 4 you will find that you need to lean your body towards the wind to counterbalance the sail. Your core muscles will get a real workout. You can also help to balance the force in the sail with your downwind paddle stroke by creating more lift by tilting the upper edge of the paddle blade slightly back during the stroke and resisting the lifting force with your arm. I find wing paddles give superior upwind stability and performance to either Euros or GPs.Using wings you will not only feel more stable when beating in F4+ winds, you will also be able to point higher due to their extra lift. As soon as you are no longer trying to point as high into the wind as possible, you should lift the forward fin completely. It is only used fully up on most points of sailing or fully down when beating. On a course of about 65 to 75 degrees off the wind (close reaching) you should ease out the sheet a little until the luff is just on the point of collapsing then sheet in just until the luff is full and smooth. You can now maintain your chosen course by putting the rear skeg down just a little. If the kayak wants to turn into the wind (luff) put the skeg down just a little more. If the kayak wants to turn away from the wind then raise the skeg a little. When the wind comes from the side (the bow is pointing 90 degrees off the wind) you are beam reaching. The sail should be further sheeted out until the luff is just full and not collapsing. The rear skeg should be put down a little further and trimmed up or down as above to maintain your course. You will find that the sail exerts less heeling force so the need to counterbalance with your weight and downwind paddle stroke is reduced. 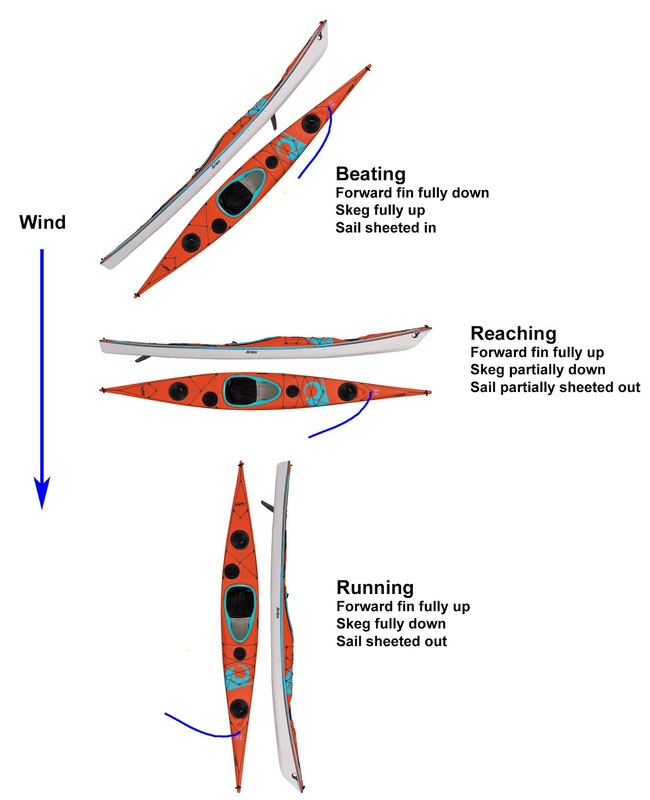 From beam reaching to beating paddle sailing a kayak will not make it go faster than its displacement speed which increases with the waterline length of the kayak. In a short kayak like the Aries the maximum displacement speed is probably around 12 km/hr, no matter how fast a paddler you are or how strong the wind is blowing. If you bear off the wind further, until you are travelling about 130 to 140 degrees off the wind, you will be broad reaching which is the fastest point of sailing. The sail will need to be sheeted out further and kept trimmed as above. The rear skeg should be put a little further down and as above trimmed to maintain your chosen course. There will be much less tipping force from the sail now and most of its power will be driving you forward. You will also find that the sail will make you feel more stable as unexpected waves catch you from behind. In these conditions I like to think of the sail as a big "air skeg". The waves will now becoming from your rear quarter and the extra power of paddle sailing will allow you to catch more waves than when paddling alone. When you catch waves the kay will start to plane (rise out of the water) and you can exceed its displacement speed. The Aries planes particularly well and you will find that when planing you can travel up to 25km per hour. At this speed the apparent wind draws ahead and you will need to sheet the sail in to stop it luffing. When you come off the wave the kayak will drop off the plane and slow down so you need to sheet out again. I have my sheet cleat mounted just in front of the cockpit near the edge of the kayak. I find I can adjust the sheet quickly without disturbing my paddling too much.Once off the plane you want to catch another wave as soon as possible. You might find that the sail tries to push you up the back of the wave in front but don't waste effort trying to break through that wave it really is uphill! Wait until the bow drops into the trough and you can feel the next wave lift the stern. Lean forward and paddle as hard as you can to catch the wave. Once you have caught it you might need to sheet in the sail again. Once you are planing try and stay on the wave as long as possible. 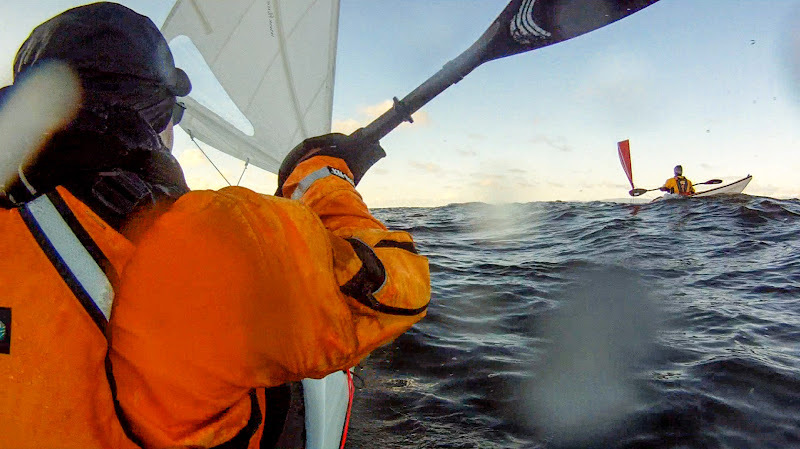 In F4 winds you will have enough power from paddle sailing to catch and plane on waves that are just not possible when paddling without a sail.As waves are seldom parallel you can often travel along a wave to where it is closer to the wave in front or even joins it. A burst of paddling should see you onto the wave in front then you can work your way along that looking for the opportunity to get onto the next wave in front. In shallow waters the waves often slow down and are not too big too overtake by climbing over their backs. Then in F4+ winds it is possible to paddle sail on a broad reach faster than the waves. Now you can look ahead to see which wave to catch. When planing you might find your kayak's response to edging changes. For example in the Aries you sink the outside edge to turn when not planing but sink the inside edge when planing. (Windsurfers will be familiar with the concept. They sink the outside edge to turn in the non planing flare gybe and sink the inside edge to turn in the planing carve gybe.) As the wind increases to the top of F4 you will begin to feel more precarious on a broad reach. The trick is to keep paddling and to paddle as fast as you can. Paddle sailing is not a rest camp. The reason to travel fast is to reduce the force of the wind on the sail. When travelling really fast downwind on a wave you will even find that the sail back winds as the apparent wind (combination of the real wind and your boat speed) actually draws forward of the mast. In extreme conditions aggressive paddling makes things much easier. The worst thing you can do is to stop paddling and lean over to leeward in a trailing low brace position. This just slows your boat speed and the apparent wind stays behind and increases as you slow making you even more precarious. Think of the trailing low brace position as the foetal position...don't give up, keep paddling! You can use any type of paddle for paddle sailing: GP, Euro or wing. I enjoy using all three and at the recent Flat Water Symposium paddle sailors were using each with equal success. However, for downwind paddle sailing in F4+ conditions I use wing paddles. This is because I find that it is difficult to keep up the higher cadence required by GPs and Euros at planing speeds of 15 -25 km/hr. At the Flat Water Symposium the winds increased to F5 and it was noticeable that those using GPs were the first to give up paddling and settle into the "safe" trailing low brace position. With the wind 180 degrees from the bow you are now running. The rear skeg should be fully down. The sail should be sheeted out but on a Flat Earth sail this does not mean the boom should always be at right angles to the fore and aft line of the kayak. As the wind increases the FE sail twists at the top of the trailing edge (roach) to spill wind in gusts. So as the wind increases you need to sheet in slightly to compensate for this twist (unless you are not looking to maximise your speed). On the run you will be travelling slower than on a broad reach but it is still possible to catch waves and plane. When this happens the fully sheeted out sail will very quickly backwind so be quick to sheet it in. Once you are on a wave you might want to increase your speed by luffing into the wind and travelling on the wave on a broad reach. This will carry you off course but you can gybe round and broad reach back in the other in the other direction. Paradoxically this is called tacking downwind and is a lot of fun and a great way to keep reasonably close to someone in your group who is paddling downwind without a sail. When sailing dead down wind with the skeg fully down and the sail fully sheeted out you might find that the kayak wants to turn round into the wind (luff) away from the side the sail is sheeted out on. Normally until now you have controlled luffing by putting the rear skeg further down. Now it is fully down so what do you do? This luffing on the run is a symptom that you are not running directly downwind. The wind from behind is probably coming from slightly to the side that the sail is sheeted out on. This is called sailing by the lee. It is easily fixed by gybing the sail over to the other side. Well that is enough to digest for the moment. Have fun and remember it is paddle sailing so no foetal positions please!